Nadina, the Russian dancer who had taken Paris by storm, swayed to the sound of the applause, bowed and bowed again. her narrow black eyes narrowed themselves still more, the long line of her scarlet mouth curved faintly upwards. Enthusiastic Frenchmen continued to beat the ground appreciatively as the curtain fell with a swish, hiding the reds and blues and magentas of the bizarre decors. I've seen bits and pieces of movies based on Agatha Christie's stories but never read any of them. So this will be my first...I've heard nothing but good things about her, thus my expectations are fairly high. I'm only a handful of pages in. As for the beginning, it's from the prologue and I like it. Nadina gives off a slight femme fatale vibe, right? 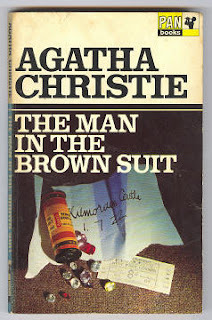 I've just recently read my first Christie novel too a month or so ago. She really is a good writer, though I should probably read more to know for sure. The images on the covers are important, as far as I can tell. The images on the cover--something to consider. Even though I've read very little, a few things on the cover make sense already. Nadina definitely sounds like a femme fatale! And I love your banner! :) Thanks for sharing! Thank you for the compliment and thanks for stopping by! I love Christie. I hope you enjoy this one - which I haven't read, so keep us posted! Will do. Thanks for visiting! Yes, I think the enthusiastic Frenchmen need to watch out for Nadina! Haha. She's a sly one, that Nadina. Thanks for stopping by! Interesting in its own peculiar way. I've never heard of the book. You'll have to tell me your thoughts when you finish it! The cover is very intriguing. I agree with you on the cover and thoughts will certainly be shared. I haven't read much Agatha Christie either, and I don't think I've heard of this story before. Looks interesting though, and I would watch out for Nadia.